GEORGE EGG: £12-£14, 7.30pm Chequer Mead, East Grinstead (01342) 302000. DIY Chef. KRATER COMEDY CLUB: Until Feb 25, 7pm/8pm/10.30pm, £5-£36.50 Komedia, 44-47 Gardner Street, Brighton 0845 293 8480. SHAZIA MIRZA: £17-£18, 8pm Trinity Theatre, Tunbridge Wells (01892) 678678. With Love From St Tropez. FEBRUARY FROLICS: Cuckfield Dramatic Society, February 23-24, Queen’s Hall, Cuckfield. This year’s annual dinner theatre event features a set of comedy sketches, as well as some fantastic food. Tickets include a hot meal (gluten free) with a choice of dessert. A vegetarian option is available if booked in advance. On the menu is cassoulet (meat or vegetarian) with a choice of breads, followed by a chocolate brownie or lemon drizzle cake. Tickets cost £15 and are allocated on tables, not to individual seats. Visit www.cdsweb.co.uk or call 01444848156. LEWES RIVERSIDE CLUB: Cane Chair Man by Angela Wiggleworth, 2pm St Thomas’ Church Hall, Cliffe, Lewes. TEA DANCE: Southwater Leisure Centre, Pevensey Road, Southwater (off Cedar Drive), 1.30pm to 3.45pm, £4.85 per person including tea and coffee. Info: Southwater Leisure Centre on 01403 733208, Colin and Margaret on 01403 734409. The Macmillan Quiz: 7.30pm, St Gabriel’s Hall, Billingshurst. Entry £2. Maximum six in a team. There will be a raffle and please bring your own drinks and nibbles. To book a table call Terri on 01403 588996. WALK: Meet 11am in the Barns Green village car park (enter over yellow hatched lines outside the Village Hall), RH13 0PT. 2-mile HDC Health walk, mostly flat, mainly on firm ground. Well behaved dogs welcome. 1 hour. Chatter Cheema 07720 714306. BRIGHTON PHILM QUARTET: £10, 8pm Komedia, 44-47 Gardner Street, Brighton 0845 293 8480. Soudscape. COURT ROOM CLASSIC: 7.30pm, Court Room, Christ’s Hospital, Horsham, 01403 247434. Acrylic Saxophone Quartet, featuring Ferio Sax Quartet. An eclectic mix of repertoire. Tickets cost £8 (concessions £7, friends £6). THE NICHOLAS YONGE SOCIETY: £15 at door, 8-25yrs free, 7.45pm Cliffe Building, Sussex Downs College, Mountfield Road, Lewes. The Romanian Arcadia Quartet performing Haydn’s Op 76 No 3, Pauza string quartet No 4 Ludus Modalis and Bartok’s No 2. Pre-concert talk at 6.45pm. Tickets: www.nyslewes.ticketsource.co.uk. BUDDY HOLLY: A Legend Reborn. £20.50, 7.30pm The Royal Hippodrome, Eastbourne (01323) 802020. FAITH: £22.50, 7.30pm Assembly Hall Theatre, Tunbridge Wells (01892) 530613. The George Michael Legacy. JAZZ CAFE: £9, 8pm Pavilion Theatre, Marine Parade, Worthing 01903 206206. Featuring Vasilis Xenopoulos. LET’S GET FUNKED: £8, 7.30pm All Saints Centre, Friars Walk, Lewes (01273) 486391. Funk, soul and reggae music. MICKY HART AND THE HARTBRAKERS: Free, 8pm Lewes Con Club, 139 High Street, Lewes 01273 473076. TERRY PACK’S TREES: £12, 8pm Under Ground Theatre, Grove Road, Eastbourne 0845 680 1926. An Unfeasibly Large Ensemble. THANK YOU FOR THE MUSIC: From £16.50, 7.30pm Theatre Royal, Brighton 0844 871 7650. The ultimate tribute to Abba and the Bee Gees. WILD WILLY BARRETT’S FRENCH CONNECTION: Presented by Horsham Folk Club. February 23, 7.45pm, £12, The Capitol studio, Horsham, 01403 750220, www.thecapitolhorsham.com. FORBIDDEN BROADWAY: £16-£17, 7.30pm and Feb 24, The Hawth Theatre, Crawley (01293) 553636. Musical satire. FUNNY WOMEN: Brighton Nights. £10-£12, 8pm Komedia, 44-47 Gardner Street, Brighton 0845 293 8480. Suitable for 18yrs plus. REGINALD D HUNTER: £23, 7.30pm De la Warr Pavilion, Bexhill (01424) 229111. Some People Vs Reginald D Hunter. BOOK, PLANT AND TOY SALE: 10am-11.45am, St. Barnabas Pastoral Centre, Worth Road, Pound Hill. Free entry, all welcome. EARLY BRIGHTON PHOTOGRAPHS: A talk by local historian Christopher Horlock, 2pm The Keep, Falmer. £3. GENERAL KNOWLEDGE QUIZ: With Quiz Master Bob May. In aid of Chestnut Tree House Children’s Hospice, 6.15pm for 6.45pm, St Mary’s Centre, Grassmere Close, Felpham. Tickets in advance £10 per person to include a Ploughman’s Supper (bring your own drinks). Teams of up to eight people. Info: Paula 01243 584843, Jenni 07790 375229. HORSHAM INTERFAITH FORUM: Monthly meeting with Insights by Revd. Alan Mayer, United Reform Church, Springfield Road, Horsham, 2pm-3.30pm. Alan’s latest book, The Empty Circle and the Cross, has just been published and will be available for purchase. Info: 07717221520. MID SUSSEX RAMBLERS: Petworth Park Circular, 5 miles with Ray 01403 783797. Meet at Petworth Park North car park, 10.30am. Rings, Wings and Spindle Whorls: 7.30pm-9.30pm, £12 (£10 concessions), The Southern Belle, 3 Waterloo Street, Hove. A unique blend of archaeology and storytelling, inspired by artefacts discovered across the British Isles, from the Iron Age, to World War 2, telling the tales of our ancestors’ lives. Tickets sw.tickets.red61.com. BRIGHTON PHILHARMONIC ORCHESTRA: £10-£32.50, 7.30pm Brighton Dome (01273) 709709. Petrenko conducts Scheherazade. TRIO DILECTIO: £10, 7pm St Laurence Church, Falmer. Kat Carson, soprano, Esin Yardimli Alves Pereira, violin and Ricardo Alves Pereira, classical guitar. Court music and more traditional folk. 50 YEARS OF BOWIE: £18.50, 7pm Chequer Mead, East Grinstead (01342) 302000. presented by Absolute Bowie. DARKSTAR RISING: Storrington Sports and Social Club, 28 West Street, Storrington, 8.45pm. EARL OKN: £10, 7pm Under Ground Theatre, Grove Road, Eastbourne 0845 680 1926. Introduced by the Dowager Lady Crabtree. LEWES SATURDAY FOLK CLUB: £6, 8pm Elephant and Castle, Lewes. Pete McClelland with Tom Evans. PHIL AND JANE: Free, 10am-noon at the regular coffee morning, Under Ground Theatre, Grove Road, Eastbourne 0845 680 1926. then Lily Ramona. SOUL LEGENDS: From £28.75, 8pm Theatre Royal, Brighton 0844 871 7650. THE BIG JIVE ALL-DAYER: £26-£29, 1pm Assembly Hall, Stoke Abbott Road, Worthing 01903 206206. The Jive Aces 12-hour marathon of non-stop jive, swing and rock ‘n’ roll. THE REELSTRINGS: Live Irish and country music, Clayton & Keymer Branch of The Royal British Legion, Woodsland Road, Hassocks, 01273 845829. EXTRA BIG NIGHT OUT: £20, 7.45pm Devonshire Park Theatre, Eastbourne (01323) 412000. The Tucker Show featuring Jack Glanville and Matthew Pomeroy. NO PETTICOATS HERE: £8-£10, 7.45pm All Saints Centre, Friars Walk, Lewes (01273) 486391. A Theatre Concert. RAILWAYS IN ART, POETRY AND MUSIC: Free, 2pm Under Ground Theatre, Grove Road, Eastbourne 0845 680 1926. Illustrated presentation by Andrew Forrest, Sheila Bugler and Robert Miles. THE STORY OF BART: £18-£19, 7.30pm The Royal Hippodrome, Eastbourne (01323) 802020. The true story of the rise and fall of Britain’s greatest songwriter. STEPHEN BAILEY: £12.50, 8pm Komedia, 44-47 Gardner Street, Brighton 0845 293 8480. Can’t Think Straight. BEACHY HEAD RAMBLERS: A Sting in the Tail, 12 miles with Gill and Reg Ha 07743 337176. Meet at Firle Beacon car park, 10am. LEWES FOOTPATHS GROUP: Blackboys, 4.5 miles with Sally and Sue H 01825 371469. Meet at North Street car park, Lewes, 9.30am. MID SUSSEX RAMBLERS: Devil’s Dyke, 4 miles with Jill 01273 480167. Meet at car par next to devil’s Dyke Hotel, 10am. THE ROYAL MARINES ASSOCIATION CONCERT BAND: £13.50, 3pm Assembly Hall, Stoke Abbott Road, Worthing 01903 206206. And Portsmouth Military Wives Choir. FRANZ FERDINAND: £30.50, 7pm Brighton Dome (01273) 709709. Plus supports. SOMEONE LIKE YOU: £18.50, 7.30pm Assembly Hall Theatre, Tunbridge Wells (01892) 530613. The Adele Songbook. SUNDAYS IN THE BAR: Free, 4pm Lewes Con Club, 139 High Street, Lewes 01273 473076. Hanna Burchell with Nic Tribe. THE BOHEMIANS: £19, 7.30pm The Royal Hippodrome, Eastbourne (01323) 802020. Queen Greatest Hits Tour. THE RAMONAS: 7.30pm Lewes Con Club, 139 High Street, Lewes 01273 473076. Tickets from www.wegottickets.com and Si’s Sounds, Lewes. THE OTHER 1% MORAI: The Coonian Ghost. £9-£12, 3pm Under Ground Theatre, Grove Road, Eastbourne 0845 680 1926. AIR ACES: Arun & Chichester Air Enthusiasts Society, www.airaces.org.uk. Info: David Batcock 01243 823007, david.airaces@hotmail.com. ‘Rhapsody in Blue – A Cold war Fighter Pilot’s Tale’ – including information about the famous 1969 Transatlantic Air Race. Presented by Air Vice Marshal (Retd.) Graham Williams at the Chichester Park Hotel, Chichester, 7pm for 7.30pm start. Air Vice Marshal Graham Williams will explain all about his amazing experiences while serving in the RAF during the Cold War Period. Entrance for Air ACES members is £3, guests £5 and under 16s free. Tickets on the door, no pre-booking. Evening of mediumship: With medium Nichola Bond, 7.30pm, with refreshments and raffle, £5, Barnham Community Hall. Yapton and Barnham SNU Spiritualist Pioneer Centre. HORSHAM: 8pm. Unattached? The Group is a club for men and women aged 50+ which meets in a pub in Horsham on the fourth Monday evening of every month. An opportunity to meet new friends. Walking, eating out, theatre, golf, holidays – all arranged by members. Visit www.thegroup.org.uk and give them a call. Sporting Gun valuation day: Great discoveries in Pulborough. West Sussex sporting gun specialist Gavin Gardiner will be visiting Pulborough and the surrounding area to give advice and free auction valuations of all types of sporting guns and rifles, both modern and vintage, as well as shooting accessories, guncases and related items. Gavin Gardiner, who has over 20 years experience of the auction world, said: “We are looking for all things shooting, but especially guns and items relating to the best and most famous makers such as Holland & Holland, James Purdey & Sons and Boss & Co.” Mr Gardiner will be available by appointment. For an appointment or more information call 01798 875300. WALK: Meet 10am, Pitch Hill car park near the quarry, 300 yards on the right beyond the Windmill Public House (GU6 7NN) north of Ewhurst village. 6½ mile HDC Health walk, includes some climbs but no stiles. Magnificent views south from Pitch Hill. Well behaved dogs welcome. Three hours. Mike 01403 242564. DUNGA FREE#7: £5, 7.30pm Komedia, 44-47 Gardner Street, Brighton 0845 293 8480. A night for the latest upcoming bands. MID SUSSEX RAMBLERS: Burgess Hill ‘Green Circle’ and Bedelands Nature Reserve, 8.5 miles with Peter R 01444 233952. Meet at St Andrews Road open space/play area, 10.30am. SEAFORD LECTURE AND LITERARY CLUB: Sri Lanka by Graham Albon, 7.30pm St Leonard’s Church Hall, Seaford. Visitors welcome £5. APOCALYPTICA: £24.50-£31.50, 7.30pm Brighton Dome (01273) 709709. Apocalyptica Plays Metallica by Four Cellos. STEREOPHONICS: From £48.95, 6.30pm Brighton Centre 0844 8471515. With special guests Ten Tonnes. 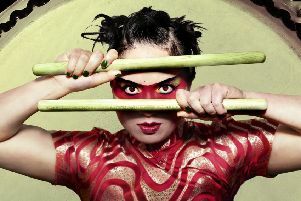 CHINESE NEW YEAR EXTRAVAGANZA: £22-£24, 7.30pm The Hawth Theatre, Crawley (01293) 553636. Showcasing Chinese performing arts. GEORGE’S MARVELLOUS MEDICINE: From £19, various times until March 3, Theatre Royal, Brighton 0844 871 7650. MURDER ON THE NILE: £13-£15, 7.30pm until March 3 (Wed/Sat mat 2.30pm) Trinity Theatre, Tunbridge Wells (01892) 678678. Trinity Theatre Club. THE MMORPG SHOW: £11.50, 7.45pm The Hawth Theatre, Crawley (01293) 553636. Combining improvised comedy and tabletop gaming. THE SOUND OF MUSIC: £25-£35, 7.30pm until March 3 (Wed/Sat mat 2.30pm) Assembly Hall Theatre, Tunbridge Wells (01892) 530613. Lucy O’Byrne returns as Maria. COMEDIANS CINEMA CLUB: £5, 8pm Komedia, 44-47 Gardner Street, Brighton 0845 293 8480. When Harry Met Sally. BEACHY HEAD RAMBLERS: Discovering Our Glorious Rolling Chalk Downland with Close Cropped Turf, 10.3 miles with Mike W 07718 141615. Meet outside Willingdon Post Office at the bottom of Butts Lane, 10am. EXHIBITION: The Book Show 2018 until March 4, Arts@The Crypt, 23 Church Street, Seaford. An exhibition of contemporary illustration and printmaking. LEWES FOOTPATHS GROUP: AGM at Cliffe Church Hall, 7.30pm. Illustrated presentations on last year’s group holidays by Margaret, Sally and Graham. Support 4 Diabetes: The group’s first meeting of their 2018 monthly programme, Salvation Army Hall, Cyprus Road, Burgess Hill, 8pm. ‘Antibiotics, why worry?’ People with diabetes, their carers and partners are all invited, as is anyone interested in diabetes. It’s free and the meeting will conclude with tea and biscuits and a general discussion on questions raised by members Further meetings on the last Wednesday of the month except August. Info: 01444 236259, www.burgesshilldiabetes.co.uk. WALK: Park at far end of Rookwood Golf Course car park, Horsham and meet 10am at the car park entrance. 4½ mile circular HDC Health walk to Broadbridge Heath, via the Riverside Walk. 1 stile. Can be muddy. 2 hours. No dogs. Michael 07719 467861. ZARA MCFARLANE: £12.50, 7.30pm Komedia, 44-47 Gardner Street, Brighton 0845 293 8480. Plus Thabo. I BELIEVE IN UNICORNS: B Michael Morpurgo. 2pm, Christ’s Hospital Theatre, Horsham, 01403 247434, www.christs-hospital.org.uk. This intimate show is set in a library full of books that hold more than stories within their pages. It is a tale of the power of books and the bravery of a young boy called Tomas. Tickets £10 (concessions £9, friends £8). THAT’LL BE THE DAY: £28, 7.30pm The Hawth Theatre, Crawley (01293) 553636. Music, laughter and nostalgia. DALISO CHAPONDA: What The African Said. £15, 8pm Komedia, 44-47 Gardner Street, Brighton 0845 293 8480. NO SUCH THING AS A FISH: £17-£19, 7.15pm Brighton Dome (01273) 709709. New UK tour. POLEGATE RAMBLERS: Look for The Black Duck, 5 miles with Judy and Diane 486756. Or, Cuckmere Valley Wander, 9 miles with Gill M 733155. Meet at Wannock Road Recreation Ground, 9.30am. THE BIG CHRIS BARBER BAND: March 1. The Capitol Theatre, Horsham, 01403 750220. OLIVER: £10-£15, 7.30pm until March 3 (Thurs/Sat mat 2.30pm) Devonshire Park Theatre, Eastbourne (01323) 412000. This is an amateur production. SING-A-LONG-A BEAUTY AND THE BEAST: £13.50-£18, 7.30pm The Hawth Theatre, Crawley (01293) 553636. Duke Of York’s (0871 902 5728): Lady Bird (15) Fri 4.15, 9.15; Sat, Mon & Thu 4.00, 9.00; Sun 10.30, 4.00, 9.00; Tue 10.30, 4.00, 9.00; Wed 3.45, 9.00; Big Scream: Wed 10.30. The Shape Of Water (15) Fri 1.30, 6.30; Sat 1.00, 6.15; Sun 1.00, 6.15; Mon 1.15, 6.15; Tue 1.10, 6.15; Wed & Thu 1.00, 6.15. Dementia Friendly Screening: The Band Wagon (U) Fri 11.00. Kids’ Club: Snow White And The Seven Dwarfs (U) Sat 10.30. Orion (01444 243300): Black Panther (12A) Fri & Mon-Thu 5.00, 8.00; Sat & Sun 3.00, 5.00, 8.00. The Post (12A) 6.00. Fifty Shades Freed (18) 8.45. Early Man (U) Sat & Sun 12.00, 2.30. Coco (PG) Sat & Sun 12.30. New Park (01243 786650): The Mercy (tbc) Fri 12.45, 6.00; Sat 3.15, 8.45; Sun 12.45, 6.00; Mon 1.00, 8.45; Tue 1.00, 6.00; Wed 12.00, 5.00; Thu 3.45, 8.45. Phantom Thread (15) Fri 3.15; Sat 12.30; Sun 8.15; Mon & Thu 6.00; Tue 3.15; Wed 2.15. Downsizing (15) Fri 8.15; Sat 5.45; Sun 3.00. Call Me By Your Name (15) Mon 3.15; Tue 8.15; Thu 1.00. Arts Centre (01483 278000): To Kill A Mockingbird (tbc) Tue 8.00. The Hawth (01293 553636): NT Encore: Cat On A Hot Tin Roof (15) Mon 7.00. Curzon (01323 731441): Three Billboards Outside Ebbing, Missouri (15) 5.00. The Shape Of Water (15) 2.00, 5.00, 8.00. Finding Your Feet (12A) 2.10, 5.10, 8.05. The Greatest Showman (PG) 12.10 (Sat & Sun only); 2.15. The Post (12A) Fri-Wed 8.10. Early Man (PG) Sat & Sun 12.15. Red Sparrow (15) Thu 7.50. Scott Cinemas – The Atrium Cinema (01342 321666): The Shape Of Water (15) Fri & Thu 2.20, 5.15, 8.10; Sat 5.15; Sun 5.15, 8.10; Mon 2.20, 5.15, 8.10; Tue & Wed 2.20, 5.15. Darkest Hour (PG) Fri & Thu 8.20; Sun 8.15. Black Panther (12A) 1.40, 4.50, 8.00 (not Sat & Wed); Sat 1.40, 8.00; Wed 3.35, 8.20. Tad The Lost Explorer And The Secret Of King Midas (U) Sat & Sun 12.40. Early Man (PG) Sat & Sun 3.10. Finding Your Feet (12A) 2.45, 5.40. Kids Crew: Ferdinand (U) Sat 10.10. Kids Crew: Paddington 2 (PG) Sat 10.10. Coco (PG) Sat & Sun 12.45. Metropolitan Opera Live: La Bohème (12A) Sat 5.30. The Greatest Showman Sing-A-Long (PG) Sat & Tue 8.20. Three Billboards Outside Ebbing, Missouri (15) Mon, Tue & Wed 8.20. Silver Screen: Wonder (PG) Wed 10.10. Royal Opera House: A Winter’s Tale (12A) Wed 7.15. Pavilion (01323 841414): Movies Make Memories: Oliver! (U) Fri 2.00. The Post (12A) Fri, Mon, Tue & Thu 7.45; Sun 2.15, 7.45; Wed 2.15. Kids 4 A Quid: Ferdinand (U) Sat 11.00. Autism Friendly Screening: Ferdinand (U) Sun 10.30. The Capitol (01403 750220): The Mercy (12A) Fri, Sat, Mon & Wed 1.45, 4.45, 7.45; Sun, Tue & Thu 4.45, 7.45. Journey’s End (12A) Fri, Sun & Tue 5.15, 8.15; Sat 12.45, 3.00; Mon 2.15, 5.15, 8.15; Wed 2.15, 5.15, 8.15; Thu 5.15. Blue Oasis Film Club Screening: The Mercy (12A) Fri 10.15. Horsham Film Society: La Familie Bélier (12A) Fri 2.00. Family Film Fun Screening: The Lego Ninjago Movie (U) Sat 10.30. Blue Oasis Film Club Screening: Journey’s End (12A) Sat 11.00. Metropolitan Opera Live: La Bohème (Puccini) (12A) Sat 5.30. Human Flow (12A) Sun 5.00, 8.00. NT Encore: Cat On A Hot Tin Roof (15) Tue 7.00. Players Theatre/Hurst Village Cinema (01273 835875): The Handmaiden (18) Fri 8.00. Lion (12A) Sun 3.00. Depot (01273 525354) (lewesdepot.org): Lady Bird (15) Fri-Tue & Thu 4.45, 6.45, 8.45; Wed 5.00, 6.45, 8.45; Parent & Baby: Tue 12.00. Journey’s End (12A) Fri 3.15, 5.45; Sat 3.30, 8.30; Sun 3.00, 5.30; Mon 3.15, 8.15; Tue 6.00; Wed 2.30, 6.00; Thu 4.00, 8.30. The Shape of Water (15) 4.00, 8.15; Sat 3.25, 6.00; Sun 4.00, 8.00; Mon 5.45; Tue 3.30; Wed 4.15; Thu 3.15, 5.45. Dark River (15) Fri, Sun, Tue & Thu 8.30; Sat 6.15; Mon 5.45; Wed 3.45. The Final Year (12A) Fri, Sun & Thu 6.30; Sat & Wed 8.30; Mon 3.45; Tue 3.15. Battleship Potemkin (PG) Sun 3.00. Women Over 50 Film Festival Best of the Fest 2017 (12A) Mon 8.00. Moonlight (15) Tue 5.30. Sing My Life (12A) Tue 8.30. Royal Opera House Live: The Winter’s Tale (PG) Wed 7.15. Stories We Tell (12A) Thu 7.00. Coco (PG) Sat 11.00; Sun 12.00. Windmill Cinema (01903 715920): The Greatest Showman (PG) Sun 12.15. The Mercy (12A) Fri, Sat, Tue & Thu 6.15; Sun 5.00; Mon 4.00; Wed 4.45. The Greatest Showman – Sing-A-Long (PG) Fri, Sat, Tue & Thu 8.30; Sun 2.45; Mon 6.10. Three Billboards Outside Ebbing, Missouri (15) Mon 8.30. Royal Opera House: The Winter’s Tale (12A) Wed 7.15. Seaford Community Cinema, Barn Theatre (www.seafordcinema.org): God’s Own Country (15) Fri 7.30. The Picture House (01825 764909): Cinephile Sunday Screening: The Long Good Friday (18) Sun 8.00. Finding Your Feet (12A) Fri & Mon 11.15, 1.45, 4.00, 6.15, 8.35; Sat 3.55, 6.15, 8.45; Sun 1.40, 6.15, 8.35; Tue & Wed 11.00, 1.45, 6.15, 8.35; Thu 1.45, 4.00, 6.15, 8.35; Parent & Baby Screening: Thu 11.20. Black Panther (12A) Fri, Mon & Thu 2.15, 5.45, 8.20; Sat 2.00, 5.40, 8.30; Sun 2.30, 5.15, 8.20; Tue & Wed 11.30, 2.15, 5.45. The Shape Of Water (15) Fri, Mon & Thu 1.15, 8.30; Sat 3.10, 8.20; Sun 3.10, 5.45; Mon 1.15, 8.30; Tue 4.30, 8.25; Wed 4.00, 8.25. Darkest Hour (PG) Fri & Mon 11.30, 6.00; Sat 1.15; Sun 12.30; Mon 11.30, 6.00; Tue 11.15, 2.00; Wed 11.15, 1.30; Thu 6.00; Parent & Baby Screening: Thu 11.10. The Greatest Showman (PG) Fri 11.00, 3.45; Sat 1.00; Sun 4.00; Mon 11.00, 3.45; Tue & Wed 4.05; Thu 3.45; Parent & Baby Screening: Thu 11.00. Coco (PG) Sat 10.45; Sun 12.00. Early Man (PG) Sat 11.00; Sun 11.45. Saturday Morning Movie: Ferdinand (U) Sat 10.30. Metropolitan Opera Live: La Bohème (12A) Sat 5.30. Eric Clapton: Life In 12 Bars, Plus Recorded Q&A (15) Tue 7.30. Royal Opera House Live: A Winter’s Tale (12A) Wed 7.15. Dome (01903 823112): Black Panther (12A) Fri 12.20, 3.15, 5.15, 8.15; Sat & Sun 10.00, 2.45, 5.25, 8.20; Mon 3.15, 5.15, 8.15; Tue 12.30, 5.15, 8.15; Wed 12.40, 5.15, 8.15; Thu 12.20, 5.35, 8.15. Early Man (PG) Sat & Sun 12.55. Parent & Baby Screening: The Greatest Showman Sing-A-Long (PG) Mon 12.00.Coco (PG) Sat & Sun 10.20. Red Sparrow (15) Thu 5.15. The Greatest Showman (PG) Fri & Mon 6.10; Tue 3.25; Wed 3.35; Thu 3.15. The Greatest Showman Sing-A-Long (PG) Sat & Sun 12.25, 2.55. The Shape Of Water (15) Fri 11.40, 8.30; Sat & Sun 5.40, 8.30; Mon 12.30, 8.30; Tue 11.45, 2.30, 5.45; Wed 8.30; Thu 2.25, 8.30. Three Billboards Outside Ebbing, Missouri (15) Fri 2.30; Mon 2.35; Tue 8.35; Wed 2.35, 5.55; Thu 11.40. Connaught (01903 206206): The Shape Of Water (15) Fri & Thu 12.15, 5.40; Sat 3.00, 8.15; Sun 3.15, 5.45; Mon 8.30; Tue 12.30, 5.40; Wed 12.30, 8.30. Phantom Thread (15) Fri & Thu 12.30; Sat 12.15; Mon 12.45. Darkest Hour (PG) Sun 12.30; Tue 12.15. Three Billboards Outside Ebbing, Missouri (15) Fri & Thu 8.20; Wed 4.00. The Greatest Showman (PG) Mon 3.30. I, Tonya (15) Fri, Tue & Thu 3.00, 5.50; Sat 5.40, 8.30; Sun 6.00, 8.30; Mon 5.50, 8.15; Wed 3.15. Finding Your Feet (12A) Fri, Tue & Thu 3.15, 8.30; Sat 12.45, 6.00; Sun 12.45, 8.40; Mon 2.30, 5.45; Wed 1.30, 6.00. Early Man (PG) Sat & Sun 10.00. Saturday Morning Pictures: Coco (PG) Sat 10.15. The Greatest Showman – Sing-A-Long (PG) Sat & Sun 3.15; Tue 8.20. Coco (PG) Sun 10.15. Silver Screen: The Shape Of Water (15) Mon 11.00. Royal Opera House: The Winter’s Tale (12A) Wed 7.15.